Obvious, it's the bit above Lower Walthamstow. It's the bit "up the hill" but not on Forest Road. If the locals aren't bothered and can catch the bus without issue I don't know why anyone else is in a flap about it. The reality is that the eastern edge of Walthamstow is covered by 4 bus routes - the 20 on Whipps Cross Rd, the 230 to Fyfield Avenue, the 123 on Forest Road and the 275 on Hale End Road. Even then a decent number of people have quite a walk from nearby stops to reach their homes - often up steep side streets. No point calling it Walthamstow, Wood Street because it does NOT terminate there. It is several stops further on from the station. If you are a local then Wood Street generally means the stretch with shops on it - between Vallentin Road and Forest Road. Of course it does continue to Whipps Cross roundabout and that's the bit that the 230 covers perfectly well. The W16 does the rest. There is no through service because for a very long time there was a width restriction under the railway bridge that preventing anything more than cars and small vans cutting through the area. I know your going to hate me for this lol but I think Upper Walthamstow, Bisterne Avenue should be used to give a little extra clarity but Upper Walthamstow is an accurate blind. Hardly. I just find it hard to get remotely agitated about blinds. It is one of those things that some enthusiasts get immensely "het up" about but having come from an area that always had very simple blinds and barely any concept of "via points" I just can't get excited about so much of what is said. I might think differently if there were hundreds / thousands of lost people unable to get around London because bus blinds were rubbish but that is demonstrably not the case. People do what they've always done - they check info at the stop, ask someone or ask the driver. I understand the historical context of blinds in London but even then I can't get excited. The only thing that DOES irritate me is TfL's inability to stop fiddling with blinds specs and designs. It must cost a fortune for the operators. Just leave it alone and let things stay settled. I nominate any bus that says "Kingston" on it. I know this will be very unpopular, and I know that fitting destination names might be a tight squeeze, but the 65 occasionally has the perfect example of what I mean. It says "Kingston, Cromwell Road" and it fits. The 111, 216, 285, 411 and 481 passengers need to know that the bus won't serve Eden Street and the Crown Court etc. I myself have helped many people who have been dumped off the 57, 131 and 213 at Fairfield, mainly because they just got on a bus that simply said "Kingston". I think it will just provide a greater amount of clarity to a confusing and busy town centre. Interesting point you make there as I’ve always wondered this. 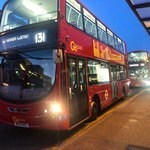 Obviously when an operator decides to update a bus’s blinds or they win a route they have to foot the bill for blinds, but surely when TfL faff and fiddle around with a route surely it’s unfair to then make the operator pay to update the blinds when it’s TfL’s doing? E.g. the 23 and it’s reroute to Hammersmith. Surely they couldn’t just say to TT ‘right we’re changing the 23 you need to pay thousands to change your blinds through no fault of your own’ unless the operator agrees to it in the contract that they pay all of said costs. I completely agree - Kingston has so many terminating points and it seems reasonable to have Cromwell Road, Kingston Hall Road, Brook Street, Wood Street (or Bentalls) & Fairfield all marked out. It's why I also hate blinds saying 'Town Centre' especially Croydon where it too has a number of terminating points. In the end TfL will pay some how. For regular churn then the blinds cost will be captured within whatever a company can charge for overheads. Where something new is required off the back of a service change then I'd expect the contract variation cost will capture genuine additional costs including a reblinding. There is obviously a need for operators to ensure blinds remain clear and usable so they will carry an element of cost for repairs / replacement of blinds. Operators will pitch their costs approrpriately to generate enough money to cover costs and earn a return from their contracted operations. Some things like decisions on new garages or new depot equipment will probably be funded corporately as essential asset replacement or investment - usually to reduce costs / improve efficiency or simply to expand operational capacity (if chasing new business). Ive always thought Tower Bridge, South Side would be more appropriate.